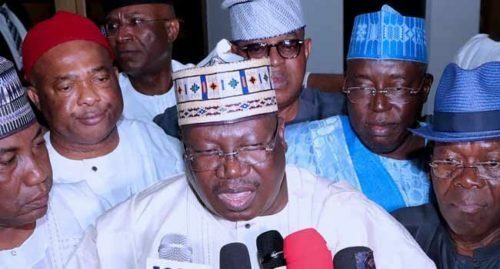 The All Progressives Congress (APC) has said that it has no iota of regret officially endorsing the senator representing Yobe North senatorial district, Ahmed Lawan, as the Senate President of the 9th Assembly. Addressing a press conference in Abuja, the APC National Publicity Secretary, Mallam Lanre Issa-Onilu, argued that if election to select the principal officers of the National Assembly will hold, it would only be mere formalities, insisting that as a party that believes in winners-take-it all, the ruling will not share any position in the National Assembly with members of the People’s Democratic Party (PDP). Mocking the opposition PDP, the ruling party said it was exhibiting ignorance by planning to share the National Assembly leadership positions with it, emphasising that no committee chairmanship position except minority and Public Account Committee will be given to the PDP senators. “In a presidential system of government, it is winner-takes-all. There is no room for power sharing with PDP. News that the party has settled for Lawan has been out. There was an interaction with the senators-elect, with the president, governors, leaders of the party and NWC members where it was presented to the stakeholders that the ruling party had decided on who will be the next Senate President according to what the democratic rule says and the person’s name is Senator Ahmed Lawan. “Since that news broke, this party has not come out to contradict itself. So, that has been done but it left for the party to cross the Ts and dot the Is to get that sorted out. “Let me take that further that my emphasis on the fact that we are not going to share power with the people that Nigerians have rejected including the fact that what the PDP people call juicy committees and we in APC call strategic committees is exclusive for APC. “We don’t need them to head any committee where they are going to compromise on the promises we have made to Nigerians. Nigerians cannot give us a mandate and we take part of it and hand over to the people they have rejected. We cannot betray the people of this country and we will not do it. “So, the zoning arrangement for the other position is in the work and just as the media and Nigerians have been informed on who our preferred candidate for the Senate President is, we will come out to tell you what the zoning formula is for the remaining offices in the Senate and also in the House of Representatives,” he said. The APC spokesperson further explained that the ruling party will not expect a single vote of the PDP senators to decide who the next principal officers will be in both chambers of the 9th Assembly, emphasising that “there is no room for power sharing because we don’t need them to run this government. “We have enough numbers to run this government. In any case, when we were campaigning, we never told Nigerians that we are going to share power with any other party. We told them please entrust power onto us fully. “It will be a betrayal of trust to go ahead and start sharing power with a party, particularly the PDP, that has been rejected by Nigerians. We are smarting from the last experience, what happened when some traitors within the APC fold sold our birthright to an opposition party. Some people now consider that to be normal, it is not. In fact, that action was not democratic,” he said.